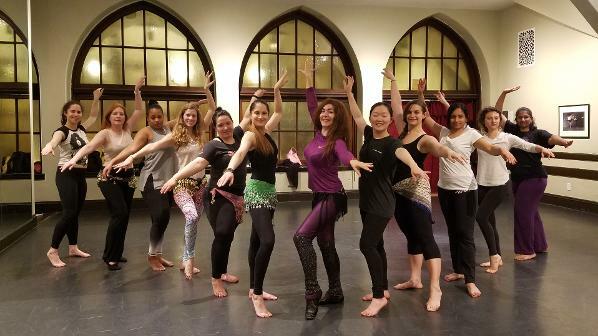 Learn Raks Sharqi (belly dance), a dance with roots in the Middle Eastern folklore that includes undulations, vibrations and sharp accents. In this dance, different parts of the body are moved independently and layered to make a unity. Every part of your body will participate, from your toes to your fingertips, your head and also your heart, as you develop body awareness and coordination. Regardless of your age or body type, you can learn something from this dance. 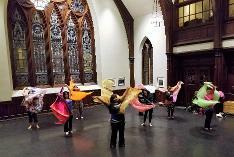 Seyyide is teaching group classes in Cambridge MA, and is available for workshops and private lessons by appointment. Any class package could also be offered as a gift certificate, should you want to give a loved one the gift of dance. Just purchase the package and send us a note to let us know. If you know what your level is, just scroll down to register. Otherwise, here are some guidelines to help you find out. Level 1: For the brand-new student, who’s never taken belly dance or just casually a few classes, or only a long time ago; and to those students with less than 6 months of experience; to learn, to establish and/or to practice the fundamental posture and movements of this dance, including musicality and transitions using basic movements of all categories. You can stay or revisit this level for as long as you wish, and take it as “the barre” of belly dance. 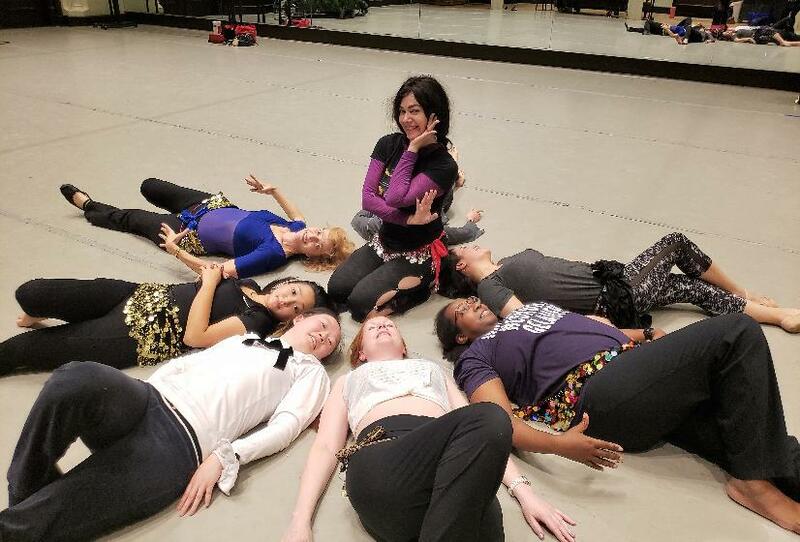 Level 2-3: For those with several months of experience, coming from another teacher/location or from my own level 1 classes, only after they have already internalized the fundamentals of belly dance, and a repertoire of basic movements, and are familiar with some rhythms and with combining movements. I recommend taking at least one month of Level 1 with me if you haven’t had experience with another teacher in Egyptian style. The Level 2 class will introduce NEW movements and go further in the combination of steps to produce a dance phrase. 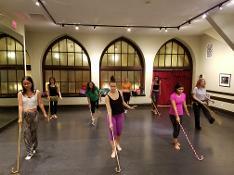 We will use veils and might also introduce some simple cane twirling technique and simple movements. Level 3-PRO: For those with at least a few years of experience, including at least some previous exposure to Egyptian style. We will use veils and canes regularly. Basic cane twirling is assumed to be known. Basic veil handling is assumed to be known. These classes include professional dancers among the students, so expect the level to raise significantly compared with the previous level. If in doubt, please ask! Sometimes I recommend taking two classes for a month, one inferior and one superior level, to fill any gaps while still challenging yourself, or at least to gauge which one is the best level for you to stick with at the present time. Admission to a certain level is ultimately at my (Seyyide’s) discretion (I will certainly make the recommendation that I think works best for YOU, me and your classmates). Don't want to wait until the start of a new package? Start classes NOW -- any time -- by using a flexible CLASS CARD. Priority to get class spots at your preferred times. NO classes scheduled on Memorial Day week. All class times available with this membership. There will be 60 CLASSES TOTAL in the three different levels, which includes 30 BEGINNER CLASSES total. If you come twice a week every week, you could take 30 classes with this pass. There are two level 1 classes per week, one level 2 class per week, and one level 3-PRO class per week, while you might not be ready to take the higher level/s yet. Regardless of how many classes you attend under this membership May to August, to continue after the end of August 2019, you will need to sign up again with a new pass, or whichever other method of your choice at that time, and the rates will correspond to the method chosen for that new registration. Expiration dates are firm and passes cannot be transferred to a different person, also cannot be transferred to a different time period. Nonrefundable. Non Transferable. Although all efforts will be made to keep schedule and location as promised, Seyyide reserves the right to make some changes to the exact schedule of the lessons and exact location (within same area). The size of the classes is limited by studio capacity so a spot cannot be 100% guaranteed at certain times in high demand unless a reservation was made in advance. Contact us if you have any questions. By clicking Buy Now and submitting your payment you agree to all the conditions above. Valid for 22 classes among those offered between MAY 6 through the end of AUGUST 2019. If you are enthusiastic and exceed the 22 classes within the period of validity of this package, you can still add more classes as you go, by paying on a per-class basis at the same reduced rate that you locked in with the pass (which is $11/class, compare with $18/class drop in fee). Regardless of how many classes you used in this period, to continue after the end of August 2019, you will need to sign up again with a new pass, or whichever other method of your choice at that time, and the rates will correspond to the method chosen for that new registration. Expiration dates are firm and passes cannot be transferred to a different month or a different person. Nonrefundable. Nontransferable. Although all efforts will be made to keep schedule and location as promised, Seyyide reserves the right to make some changes to the exact schedule of the lessons and exact location (within same area). Contact us if you have any questions. Every MONDAY at 8:40 pm, in CAMBRIDGE, starting on 5/6/2019 and ending on 6/24/2019 (7 classes). This class is suitable for Novice to Beginners or anybody who wants to work on the fundamental moves of Egyptian style oriental dance. 7-class PACKAGE for $118 (5/6, 5/13, 5/20, 6/3, 6/10, 6/17 and 6/24/2019 ONLY). Alternatively, provided that a spot is available, drop ins are welcome, on a first-come first-served basis, at the door price of $18/class. Class cards are also welcome, which allow you to start at any time. Seyyide specializes in Egyptian style and we'll work on the fundamentals of this dance as well as combining, movements, transitions, musicality, of course, as always, taking special attention to posture and stage presence (whether you aspire to perform or not). Wear comfortable clothes as you would for a yoga class. Barefoot, ballet slippers or dance shoes (street shoes not allowed in the studio). A scarf to tie at your hips is optional. – Location: Jose Mateo Ballet Theater. 400 Harvard St., Cambridge, MA. – Time: MONDAYS 8:40 to 9:40 pm. – Dates: 5/6, 5/13, 5/20, 6/3, 6/10, 6/17 and 6/24/2019 ONLY. Payment for this session applies to and only to these dates and cannot be carried over. Non-transferable to other persons. Payment is nonrefundable. Registration for these classes will be accepted on a first come first served basis and limited to a maximum of 20 students to provide plenty of opportunities to get feedback and individual attention. By submitting your payment, you accept all conditions established above. For questions, go to our contact page or call 774-473-9785 (7744-SEY-SUL). TUESDAYS at 7:35 pm, in CAMBRIDGE, starting on 5/7/2019 and ending on 6/25/2019 (7 classes). 7-class PACKAGE for $118 (5/7, 5/14, 5/21, 6/4, 6/11, 6/18 and 6/25/2019 ONLY). Alternatively, provided that a spot is available, drop ins are welcome, on a first-come first-served basis, at the door price of $18/class. Class cards are also welcome, which allow you to start at any time. –Time: TUESDAYS 7:35 to 8:35 pm. – Dates: 5/7, 5/14, 5/21, 6/4, 6/11, 6/18 and 6/25/2019 ONLY. Payment for this session applies to and only to these dates and cannot be carried over. Non-transferable to other persons. Payment is nonrefundable. Registration for these classes will be accepted on a first come first served basis and limited to a maximum of 17 students, due to studio capacity and to provide plenty of opportunities to get feedback and individual attention. By submitting your payment, you accept all conditions established above. For questions, go to our contact page or call 774-473-9785 (7744-SEY-SUL). MONDAYS at 7:35 pm, in CAMBRIDGE, starting 5/6 and until 6/24/2019 (7 classes). This class is an intermediate level, and suitable for Advanced-Beginners through Intermediate students. Advanced dancers may also find this class suitable as training, and often find some new things too. 7 class-PACKAGE for $118, valid for the following dates ONLY: 5/6, 5/13, 5/20, 6/3, 6/10, 6/17 and 6/24/2019. Alternatively, provided that a spot is available, drop ins are welcome, at the door price of $18/class, on a first-come first-served basis. Class cards are also welcome, which allow you to start at any time. - VEIL: a piece of chiffon or silk about 3 yards long, it should be floaty and have no heavy hemming. Bring always. Some available for purchase from instructor. - FINGER CYMBALS (sagat, also known as zills). Bring always. Wear comfortable clothes as you would for a yoga class. Barefoot, ballet slippers or dance shoes (street shoes not allowed in the studio). A scarf to tie at your hips is optional. Some hip scarves and veils might be available to purchase from the instructor. - Location: JMBT, 400 Harvard St., Cambridge, MA. - Time: MONDAYS 7:35 to 8:35 pm. - Dates: 5/6, 5/13, 5/20, 6/3, 6/10, 6/17 and 6/24/2019 ONLY. Payment for the session applies to and only to these dates, is non-transferable to other dates, or to another person, and cannot be carried over. Payment is nonrefundable. Registration for these classes will be accepted on a first come first served basis and limited to a maximum of 18 students, to provide plenty of opportunities to get feedback and individual attention. By submitting your payment, you accept all the conditions established above. For questions, go to our contact page or call 774-473-9785 (7744-SEY-SUL). This class is suitable for advanced students, professional dancers, and some intermediate Students that are ready to grow. As a minimum, you should already be comfortable with all the material in my current Intermediate level classes. Beginners with no or little experience will NOT be prepared for the pace of this class. We work on advanced movement technique as needed, as well as in choreography, musicality, stage presence, general knowledge of the music, and more. TUESDAYS at 8:40 pm, in CAMBRIDGE, starting 5/7/2019 and until 6/25/2019, for a total of seven (7) classes. Seven class package for $125, valid for 5/7, 5/14, 5/21, 6/4, 6/11, 6/18 and 6/25/2019 ONLY. Alternatively, you have the options to drop in, provided that a spot is available, and paying the door price which is $20/class for this ADVANCED level. Class cards are also welcome. - VEIL: a piece of chiffon or silk about 3 yards long, it should be floaty and have no heavy hemming. Barefoot, ballet slippers or dance shoes (street shoes not allowed in the studio). - Location: Jose Mateo Ballet Theater. 400 Harvard St., Cambridge, MA. - Time: TUESDAYS 8:40 to 9:40 pm. - Dates: 5/7, 5/14, 5/21, 6/4, 6/11, 6/18 and 6/25/2019 ONLY. Payment applies to and only to the dates described above, non-transferable to future dates. Registration for these classes will be accepted on a first come first served basis, and limited to a maximum of 15 students, due to studio capacity and to provide plenty of opportunities to get feedback and individual attention. Payment for the session applies to and only to the dates above and cannot be carried over. Non transferable to other persons. Payment is nonrefundable. By submitting your payment, you accept all conditions established above. HAVE YOU MISSED THE BEGINNING OF THE SESSION? Don't want to wait until the beginning of next session? DO YOU TRAVEL OR BUSY AND CANNOT COMMIT TO ALL WEEKLY CLASSES IN A SESSION? NO PROBLEM, THE CLASSES ARE ONGOING, YOU CAN STILL START ANYTIME! 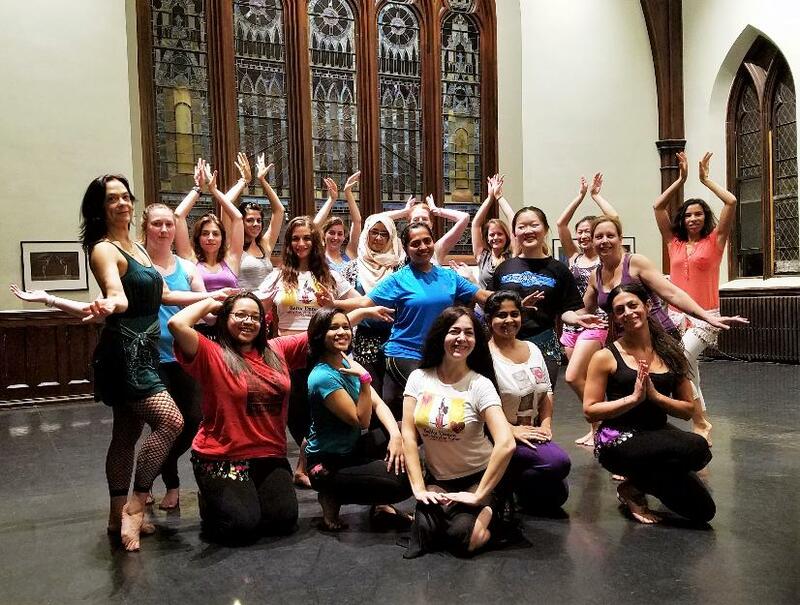 Seyyide will teach an introductory belly dance workshop in BOSTON. The fundamentals of belly dance (Egyptian/Arabic style) will be presented and you will learn many must-have movements. This class will be suitable for novice and beginner students. Two hours. For dancers who have already learned/ mastered the fundamental movements of belly dance. How about putting them together in a special way?... Let's dance! We will work on a choreography to a an Arabic-pop song. The emphasis will be on musicality, transitions and use of the space, as well as stage presence. This workshop is multilevel, okay for beginners with at least a few months of experience through advanced dancers. For dancers who have already learned/ mastered the fundamental movements of belly dance. Lean the structure of this exciting part of the Arabic show. From understanding the music, the sequence of the progression, the mood, to technique for moves that will allow you to express each one of these parts appropriately. This workshop is multilevel, okay for intermediate through advanced dancers. We will experiment with a few signature movements of the Stars of Egypt from years 1940 to 1960: Taheyya Carioca, Samia Gamal and Suhair Zaki. This workshop is multilevel, okay for beginners with at least a few months of experience through advanced dancers.